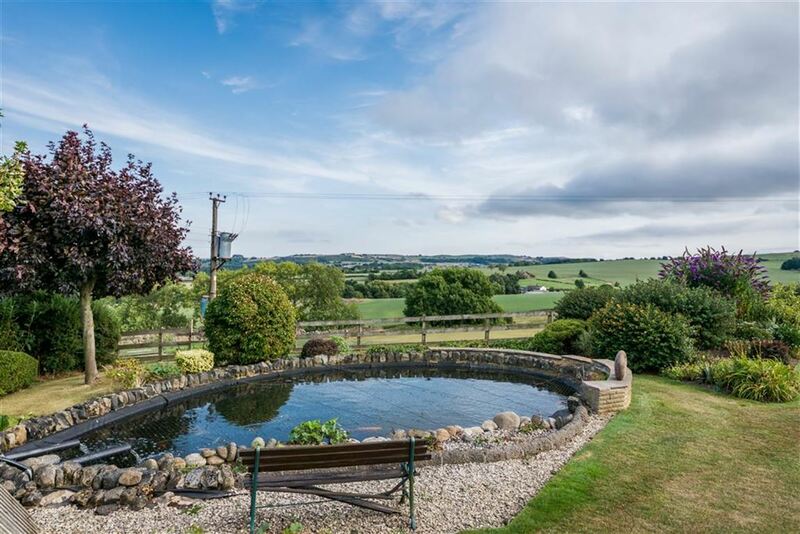 SET BETWEEN THE HIGHLY REGARDED VILLAGES OF FARNLEY TYAS AND THURSTONLAND LUMB HOUSE FARM OCCUPIES A STUNNING LOCATION WITH FAR REACHING SOUTHERLY VIEWS OUT OVER GARDENS AND FIELDS. 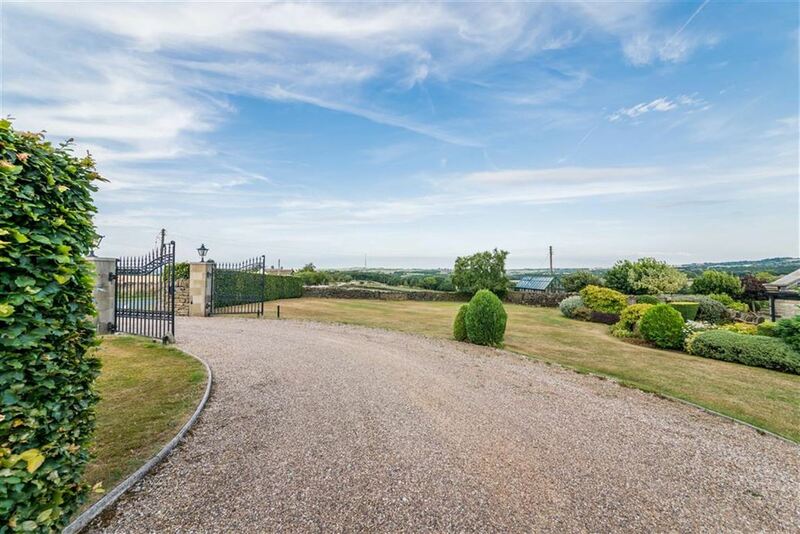 STANDING IN APPROXIMATELY 3 & ½ ACRES WITH A FURTHER APPROXIMATELY 5 ACRES AVAILABLE VIA SEPARATE NEGOTIATION, THIS EXCEPTIONALLY LARGE HOME HAS AN ACCOMMODATION THAT IS SURE TO PLEASE, ALL THE PRINCIPAL ROOMS ENJOY THE STUNNING VIEWS, TWO EXTRA ROOMS PROVIDE A GREAT DEAL OF FLEXIBILITY. 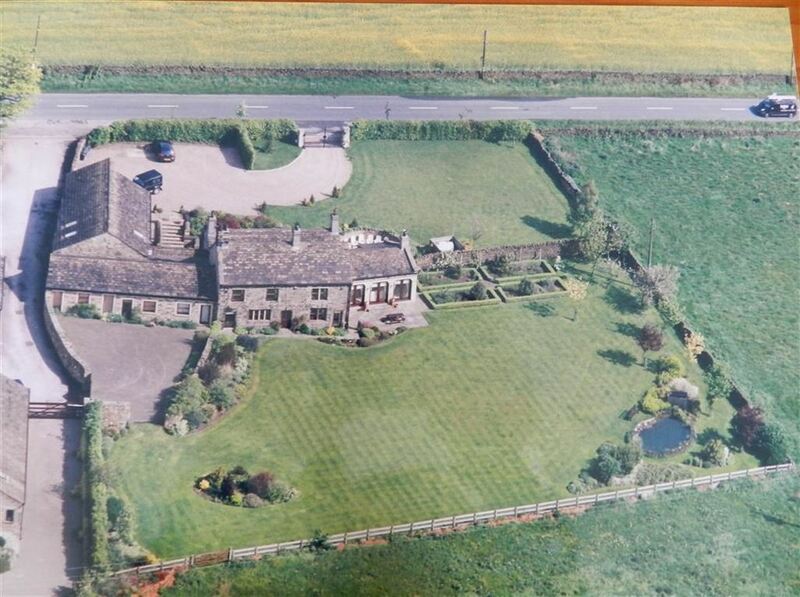 The 5/6 bedroom accommodation briefly comprises entrance hall, superb dining kitchen, dining room, utility room, family room, snooker room, study area, bedroom five/gym, four further bedrooms, two house bathrooms, two en-suites, triple garaging, impressive driveway, beautifully, manicured gardens, golf tee and pond, paddock and delightful location. A beautiful polished timber and glazed door sheltered by a large storm porch/portico gives access though to the entrance hall, this entrance hall with Amtico flooring sets the scene in terms of size and style that is to be viewed throughout this very extensive home, it has inset lighting to the ceiling, coving, beautiful understairs storage cupboard, hall robes, downstairs w.c. Beautifully fitted with low level w.c. pedestal hand wash basin and tiling to the half height, adjoining is a study. Another pleasant view out over the gardens. 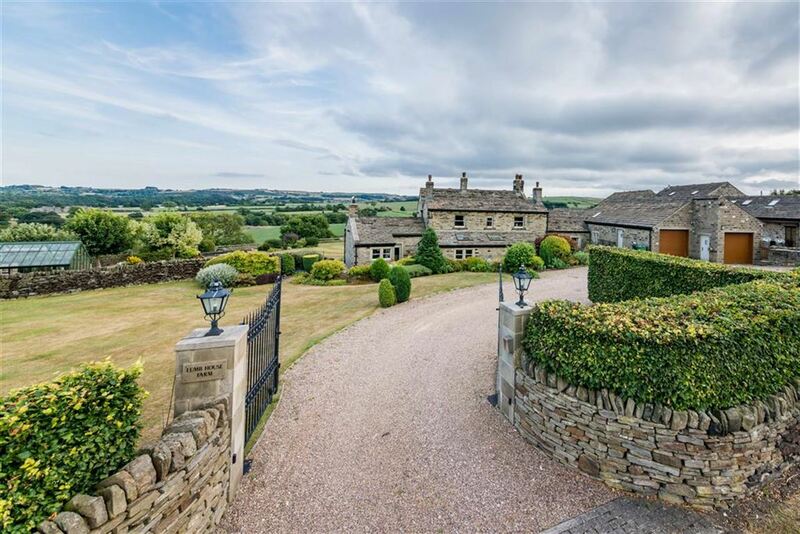 The farmhouse hallway gives direct access out to the front lawns. 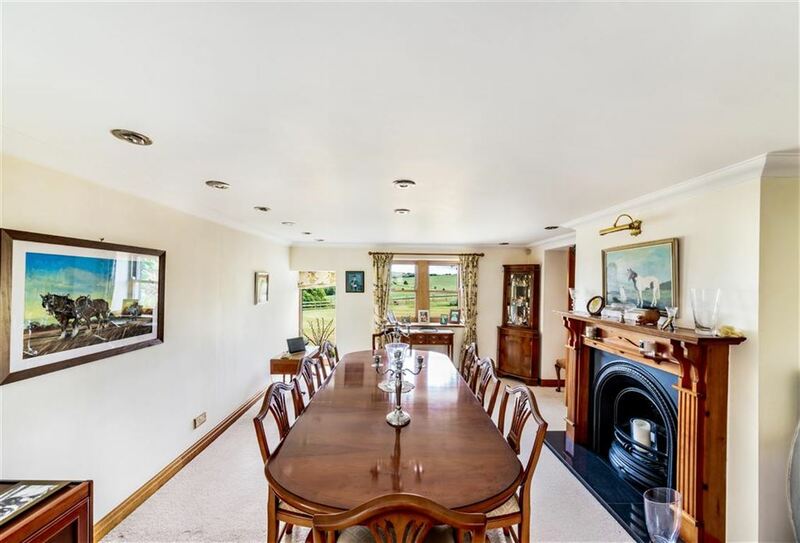 This as the photographs and floor lay out plan suggest is a quite simply stunning room. 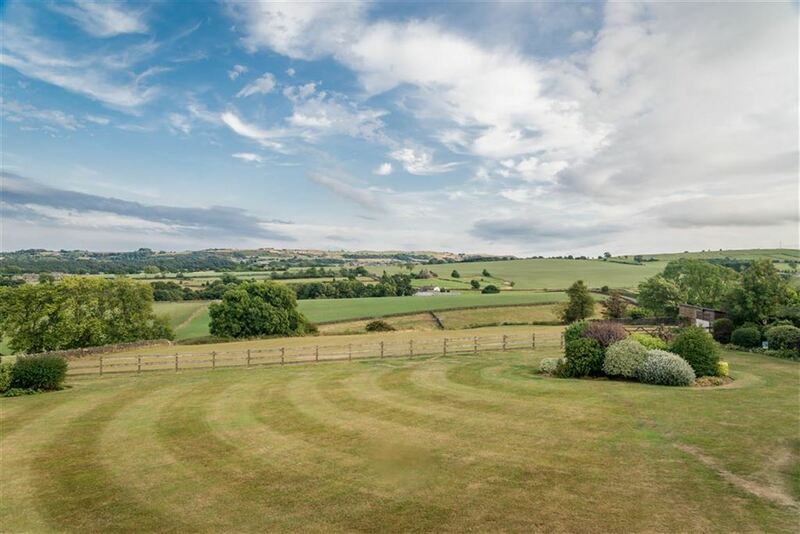 It has wonderful views out over the gardens, fields and superb countryside beyond, this all being in a Southerly direction, is a setting that is truly remarkable and all of the principal rooms within the house overlooks this view. The sitting room has a beautiful high ceiling line with inset lighting. There are other feature windows overlooking the driveway side and the gardens adjoining. There are also glazed doors out to both the front and rear. 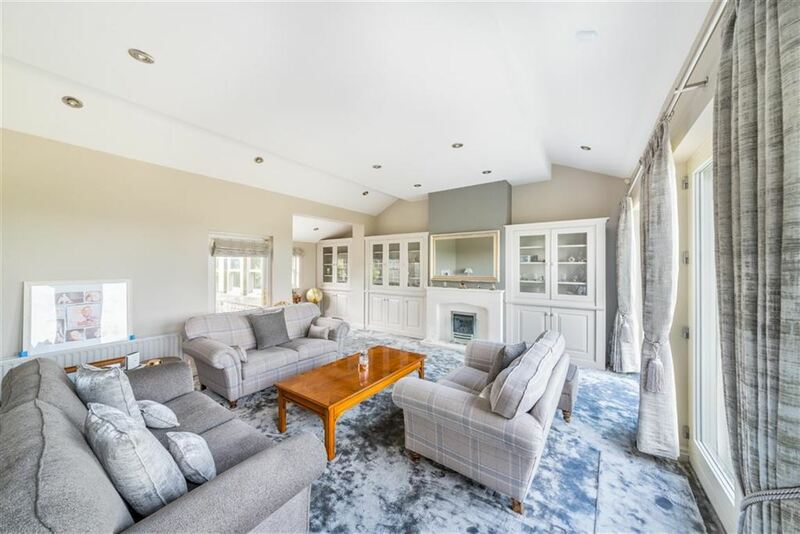 With delightful in built furniture including cupboards and display cabinets, there is a beautiful polished stone fireplace with gas coal burning effect fire and the mirror above is in fact a TV therefore there is prevision for wall mounted TV and this mirror/TV is available by separate negotiation. 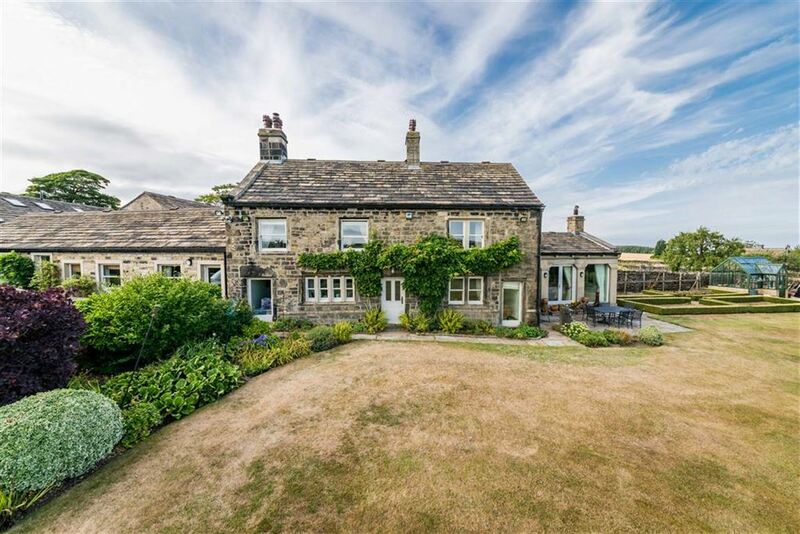 Often used as a further sitting room, this room once again enjoys the super view courtesy of period windows and a further window to the floor height. There is a period style fireplace with Victorian style open fired grate and polished timber surround, inset spotlighting to the ceiling and picture lighting. This delightful room once again enjoys the stunning views courtesy of period windows and further good sized window. There is prevision once again for wall mounted TV, beautiful stone fireplace with wood burning stove. 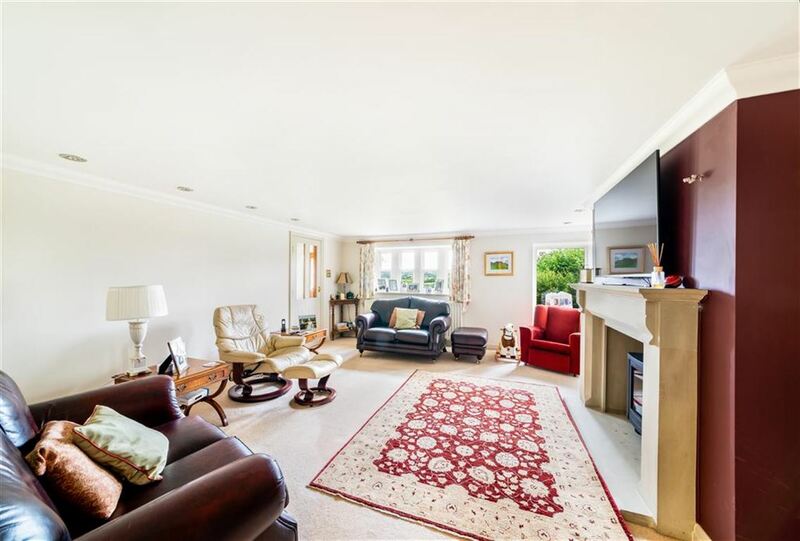 The living room is decorated to a high standard, has coving to the ceiling and inset high specification lighting. 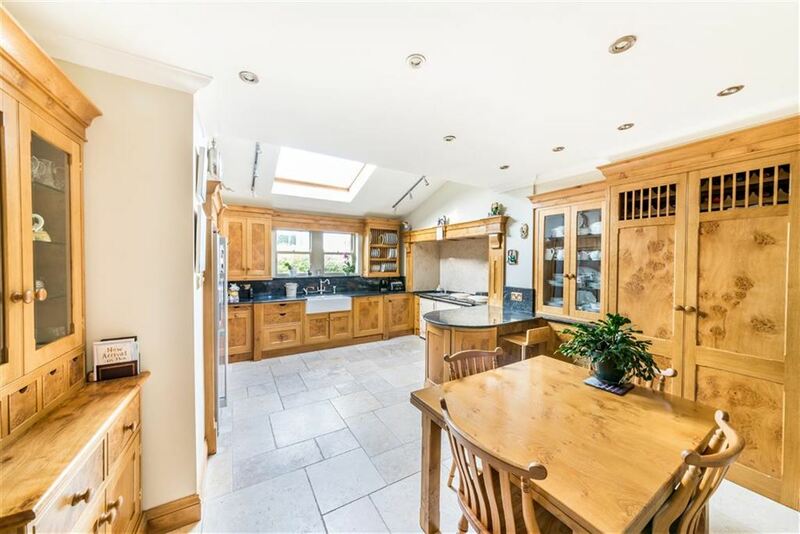 Beautifully finished in oak this wonderful kitchen is particularly charming in terms of its design and delightful outlook. There is a large Velux window, inset spotlighting to the ceiling, provision for wall mounted TV, beautiful polished limestone floor, delightful aga of a four oven design with two hot plates and warming griddle to one side, integrated Siemens oven/grill, integrated dishwasher, housing point for American style fridge freezer with ice and drinks dispenser, Villeroy and Boch twin bowl wash hand basin with high specification taps over, display cabinets, centrally located pantry cupboards. 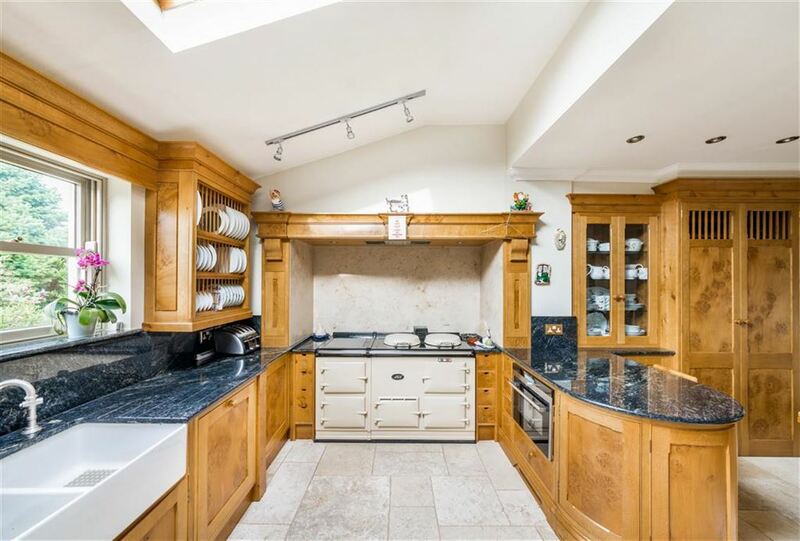 There is a breakfast bar and glazed display cupboards with drawers and display shelves. All is of the very highest quality and presented beautifully. A stable style door gives access through to the utility room. This large utility room has a further timber and glazed stable style door out to the gardens, large Velux window, cupboards above to high and low level, home for the property's central heating boiler, plumbing for automatic washing machine and space for a dryer, inset ceramic sink unit. 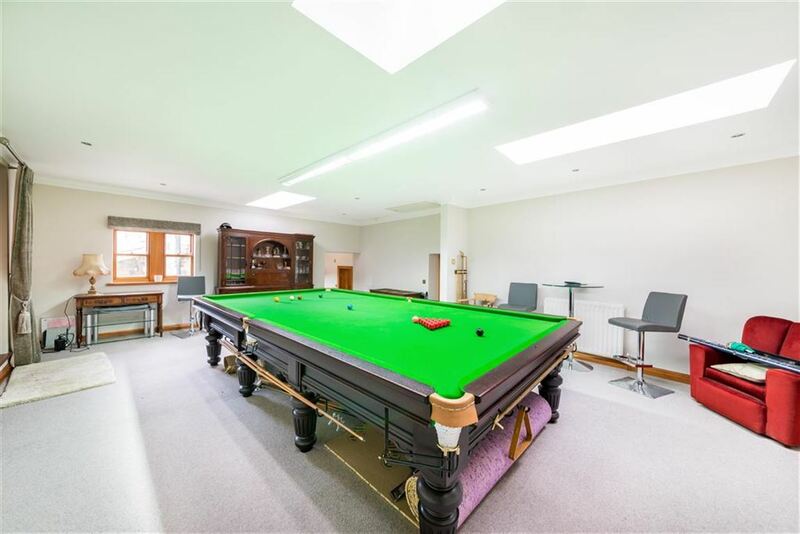 Off the hallway steps lead up to the fabulous snooker room. This wonderful room is of huge proportions, has windows to two sides and good sized Velux windows. The room is appropriately lit and has inset spotlighting, prevision for wall mounted TV. 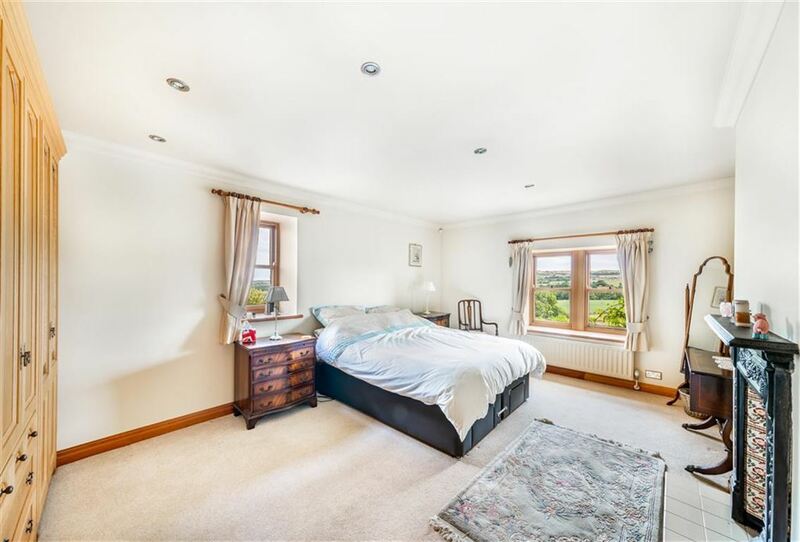 Please note this room was subdivided in a previous ownership creating a further bedroom if so desired. 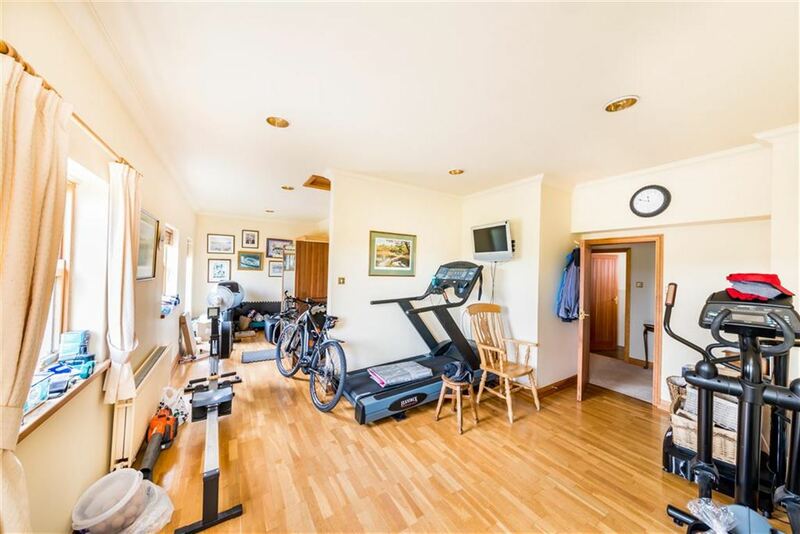 Which is currently used as a gym, has a beautiful polished timber floor, three windows overlooking the gardens and secondary driveway and also a glazed door giving direct access out to the driveway. There is inset lighting and coving to the high ceiling height. Nearby there is the ground floor house bathroom. This serves bedroom four and bedroom six if it was to be put back in place. This is of a good size and has a four piece suite including bath, low level w.c. pedestal wash hand basin and good sized shower cubicle. 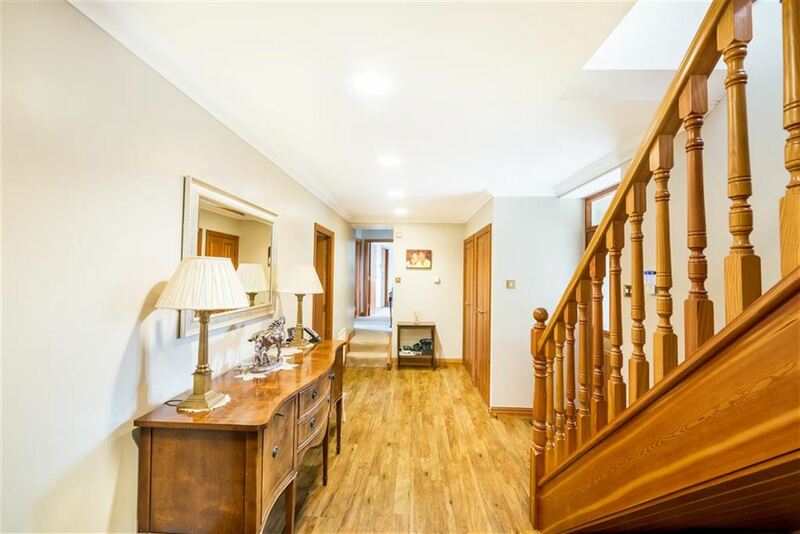 An en suited double room which again enjoys a pleasant outlook with in built bedroom furniture, high quality flooring, two windows giving a lovely view. 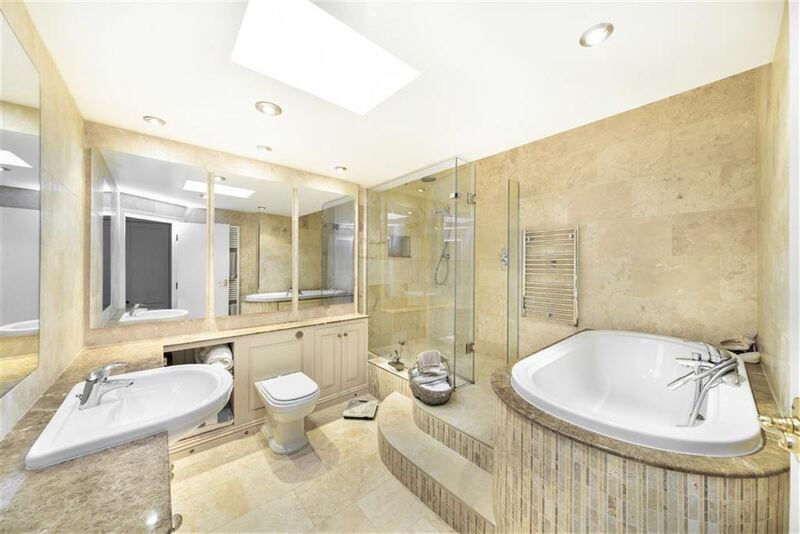 Including large shower with glazed doors and stylish wash hand basin and low level w.c. with polished timber seat. Two staircases give access to the first floor level, one from the principal hall the other from the front hall that gives direct access out to the gardens. 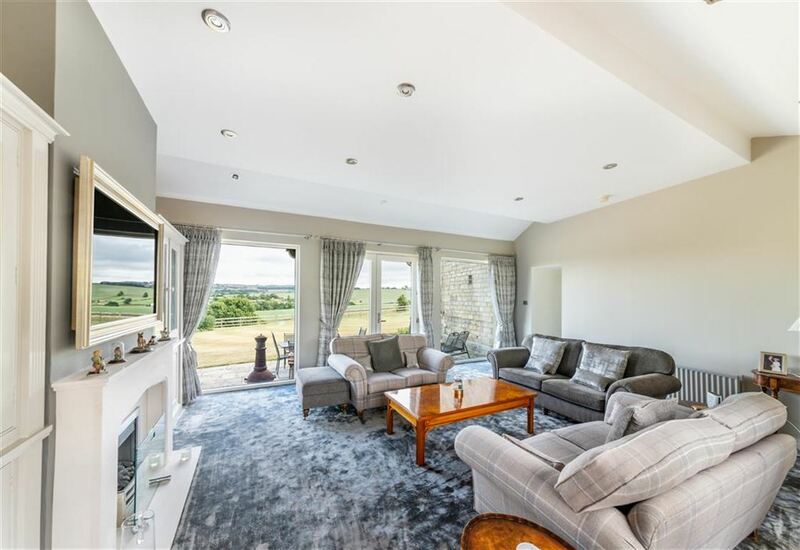 The first floor landing has a window giving a lovely view out over surrounding countryside. 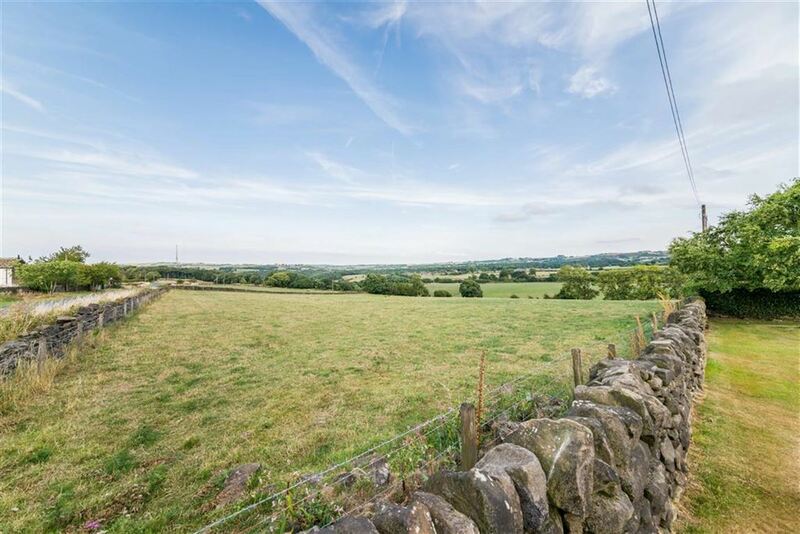 A large double room, stunning views courtesy of twin period windows. 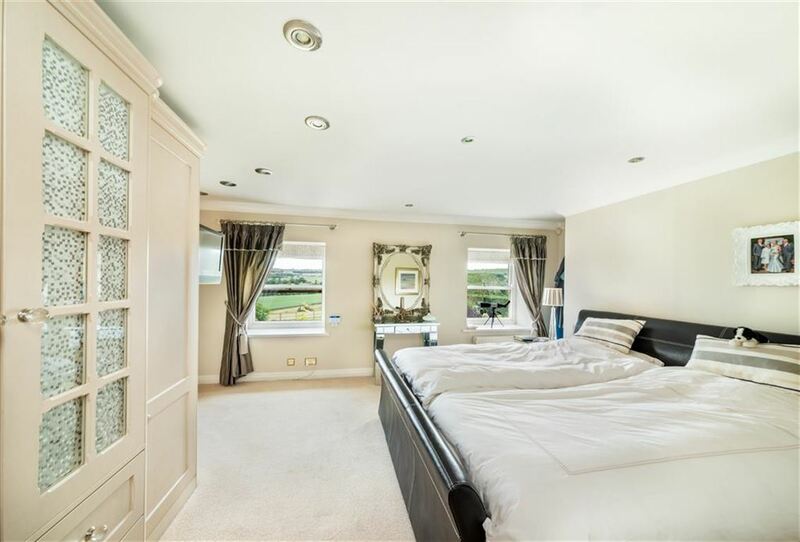 This room has inset spotlighting to ceiling, coving, a fabulous array of in built bedroom furniture and a beautiful en suite. 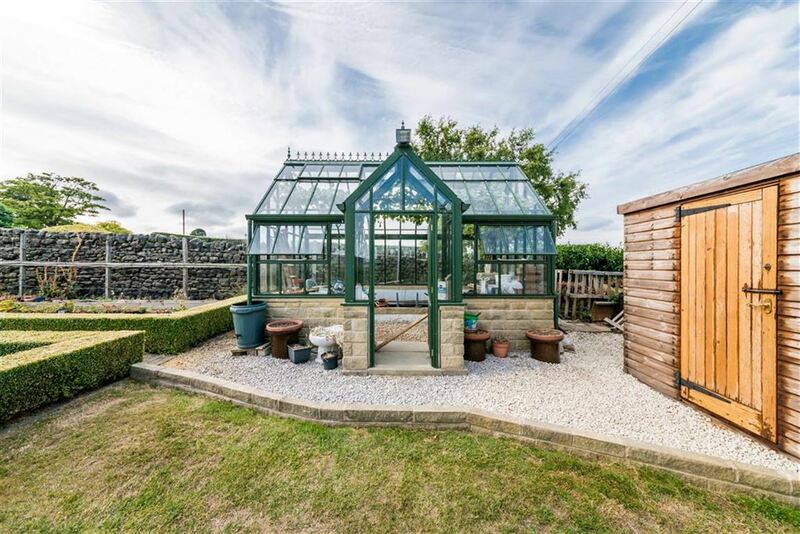 The en suite has been updated in recent times and incorporates a double ended bath, large cube glazed shower, concealed cistern w.c. and wash hand basin. All is of high quality manufacture, beautifully finished with the upmost care, integrated mirrors. 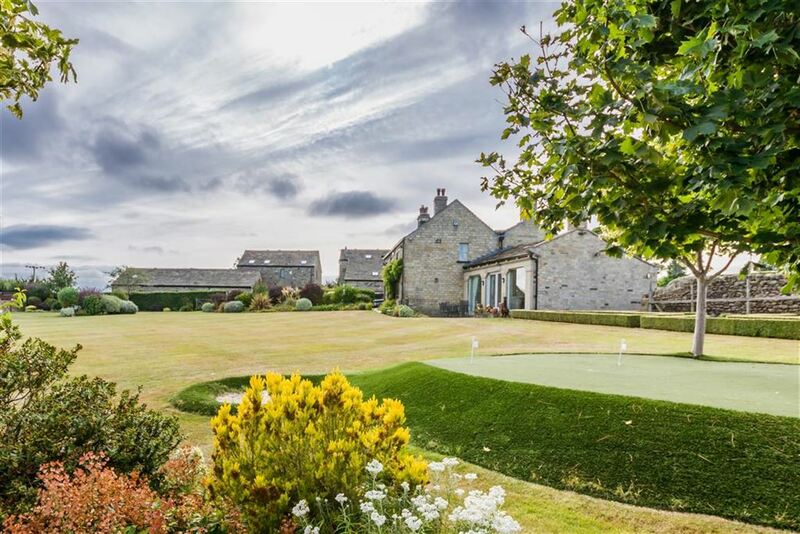 A delightful bedroom with is of a substantial size, having windows to both the front and side enabling fabulous views to be enjoyed. There is once again high quality inbuilt bedroom furniture including display shelving, drawers, wardrobes and the like. There is a Victorian style fireplace with open fire grate with a raised hearth and floral tiled side panels. The room has inset spotlighting to the ceiling, a further loft access point and central heating radiator. 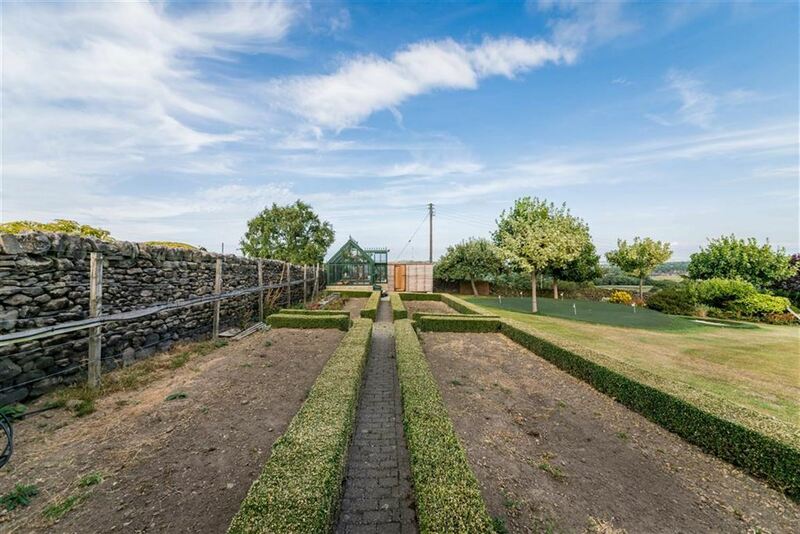 With a pleasant view to the driveway side, this bedroom is of a good size and has inbuilt wardrobes, storage cupboards, display shelving and desk. There is a central heating radiator. 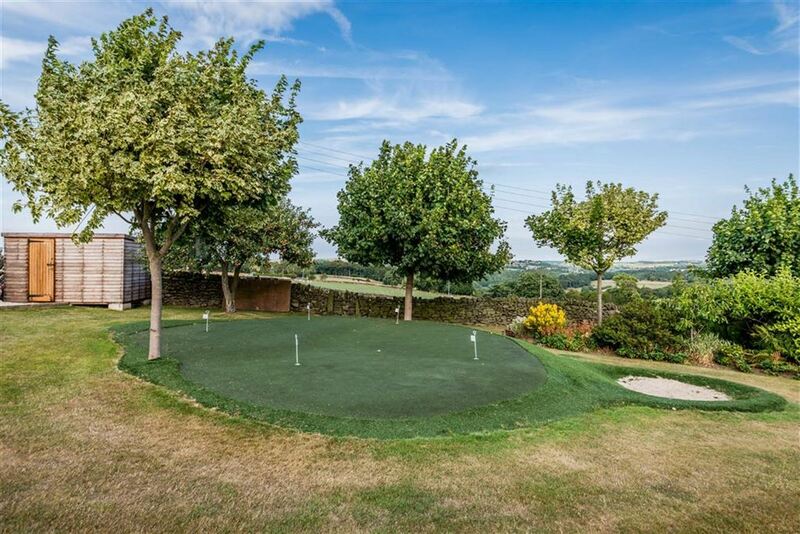 This is to be found at the first floor level and is of large proportions and once again is fitted to a particularly high standard. It has a four piece suite that comprises low level w.c, vanity unit with corian surface, cupboards and drawers beneath, display shelving to either side of the display mirror, bath with Victorian style hand held mixer tap shower unit over and display panels being mirrored glazed, all set within an arched top canopy. There is a substantial shower of large proportions and has a high quality shower fitment. There is an airing cupboard being home for the second hot water tank, automatic extractor fan and shaver socket. The bathroom is finished with dado panelling in timber and has a central heating radiator and view to the driveway side. 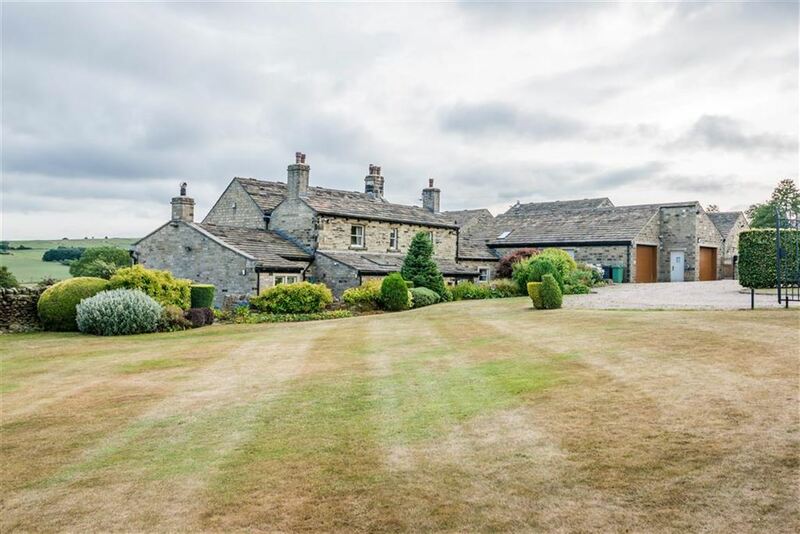 Set back from the road Lumb House farm is approached through beautiful gates giving access to a large driveway which in turn gives access to the property, triple garaging gardens and paddock, please note a secondary driveway also gives access to a rear courtyard, principal gardens and the paddock, the driveway is shared with the two neighbouring high quality homes, as photos suggest the gardens are beautifully kept and include veg garden area with high quality greenhouse, golf tee and a delightful pond, the field provides a huge amount if security in terms of the views and once again is well boundaried and presented. 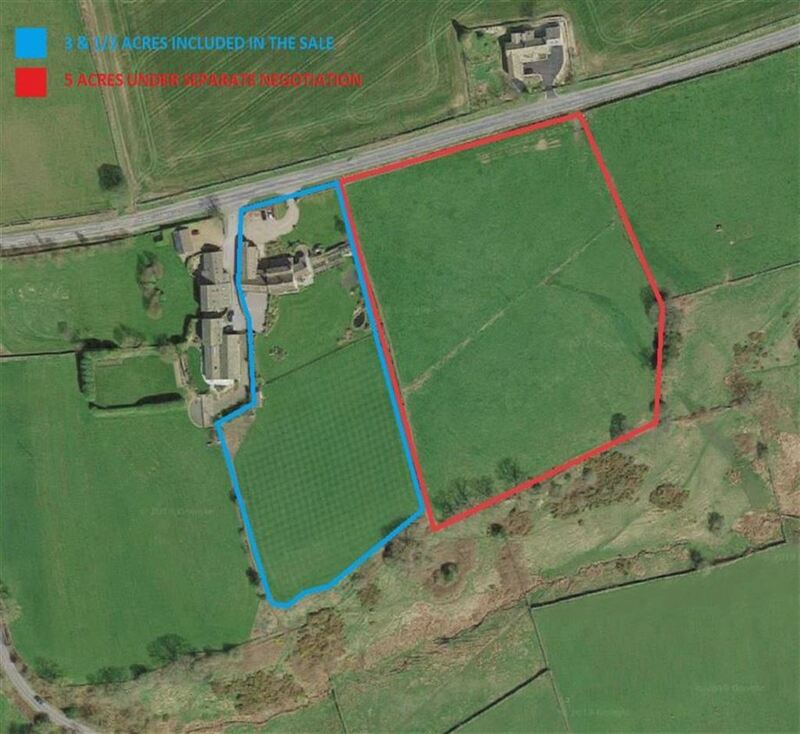 Adjoining land purchased separately a few years ago the approximately five acres enjoys a separate access from the road way and is well boundaried and maintained, this is available by separate negotiation if required.